Anyone know if there are any 3rd party compatible freesync LCD's for this laptop? Also, I found this 17.3" QHD panel (http://www.panelook.com/B173QTN01.4_AUO_17.3_LCM_overview_31906.html) which might be a worthwhile upgrade since the laptop packs an RTX 2070. Can anyone tell me what panel these use by default? Amazing chassis. 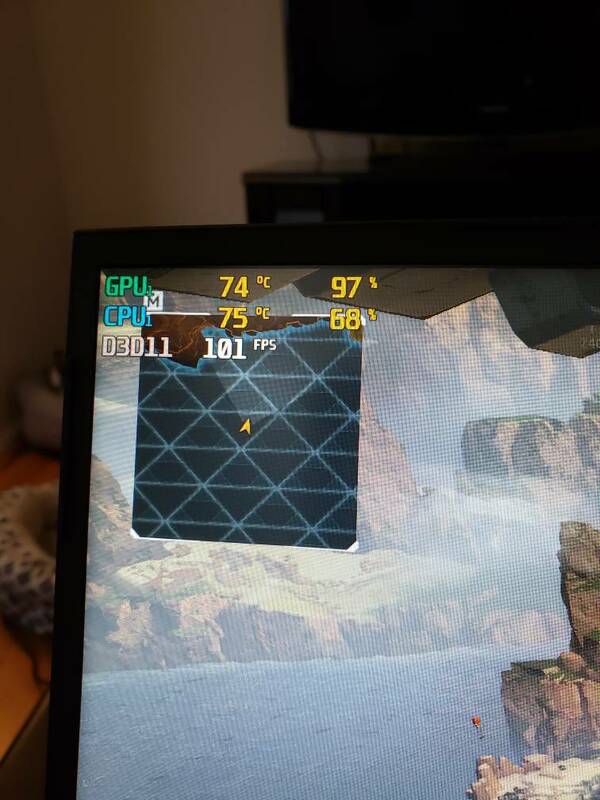 This is after a - 150 undervolt on the CPU and an undervolt on the GPU. This is after 1 hour of CSGO in a 72° room. What program do you use there to monitor temps? I use MSI Afterburner for On Screen Display and HWInfo64 for logging. How is the laptop hinge? Wondering after Bob of all trades review of the Lenovo talked of the hinge problems after a few weeks of use. Anyone had issues with a Tongfang after a few weeks? that was an initial concern of mine when i first got my unit. The lid felt it had more bobble than i'd like. I think it stems from it being such a thing panel and relatively light so it just reacts quicker. The hinges themselves are top notch, smooth as silk with the right amount of tension. You will be CPU limited way before 240hz at 1080p. jrwingate6, AyoMayo and Riktar like this. After 3 hours of straight Apex Legends. She's still not breaking a sweat. LamsonMusic and Riktar like this. I think my laptop has a defect. Just asking to see if anyone has heard of something like this and know of a self-fix. When the charger is plugged in, the strip below the screen/above the keyboard, to the left of the power/fan buttons, and the lid. When I run my fingers across, I feel a vibration. When I touch the lid, it "vibrates" so I think there's an electrical short somewhere and it's passing current through those parts where it shouldn't. Anyone know of what may cause that? It's not the fans running, is it? Thats ground leak current, check that the wall socket has a protective earth wire properly wired, if the charger only has two prongs, rotate the plug 180º so the prongs swap place in the wall socket, might help. Thanks. I'll try with different outlets to see if it's because some aren't grounded properly. When the laptop is in sleep mode (fans off) it still does it. It only stops when I unplug. I've found a number of replacement chargers on Taobao. If I get a 120 or 150W charger, would it cause any problems when I'm not playing games? The CPU alone at full power prob. doesn't draw that much and it's the video card that would exceed 120/150? I want a lighter charger to carry around when traveling instead of this brick. Speaking of chargers, was anyone able to find a 230w (RTX 2070) version? Eluktronics doesn't have any available and apparently won't have any available for the foreseeable future. On another note, i just found out the unit actually works with Windows Hello... that was a welcome surprise.